NEIL YOUNG : “AMERICAN STARS N’ BARS” reissue CD…..
After years of grumbling from NEIL YOUNG-come-latelys like myself, four of his late 1970s/early 80s releases are finally out on CD for the first time: “On The Beach”, “Re-ac-tor”, “Hawks and Doves” and “American Stars N’ Bars”. This is likely big news for those of you who’ve been scouring the bins for the original vinyl; a couple of these just seem to have disappeared and have been commanding collector prices, despite their popularity and large print runs at the time. The one I didn’t have a digitized version of already is “American Stars N’ Bars”, so I set about to right that wrong. While Young gets many kudos for the more mournful and bitter “Tonight’s The Night” , “Zuma” and “On The Beach”, he also added a touch of levity and barroom fun to some of his records, and this one certainly fits in that camp. It’s cobbled together from a bunch of different recording sessions in the mid-1970s, but you’d never know it – only the majestic, roaring 10-minute Crazy Horse opus “Like A Hurricane” stands out significantly. 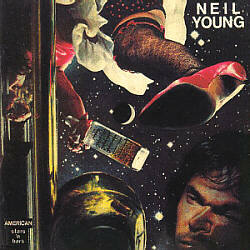 “Stars N’ Bars” is really an album chock full of weed smokin’, Laurel Canyon countrypolitan honk. I got to thinking: the line that separates 1970s Neil Young from, say, the Eagles is strangely not that pronounced (e.g. this record’s backing vocals from Canyon doyennes Linda Ronstadt and Nicolette Larson), and their FM radio fan bases certainly overlapped during this era. Yet the former stands tall today because of his unorthodox vocal style, his remarkable consistency despite frequent stylistic diversions, and his amazingly hard-rocking, guitar-drenched band. The latter, well, they just flat-out sucked. This record has a number of fantastic songs that didn’t make it to “Decade” and which I’d therefore never heard until this week: “Saddle Up The Palomino”, “Bite The Bullet” and “The Old Country Waltz” are all top-drawer. “Homegrown” takes me back to my 8th grade classmates expounding on their love for “killer green indica homegrown skunk bud” without having the slightest idea what they were talking about. If this one wasn’t an anthem of sorts to them and their stoned siblings, I’d be quite surprised. The long and short of it is that “American Stars N’ Bars” is yet another 1970s Neil Young CD unarguably worth owning, and since they’re blowing it out at “the nice price” of $9.99, I’d reckon you might want to check your wallet for that ten-spot right about now.